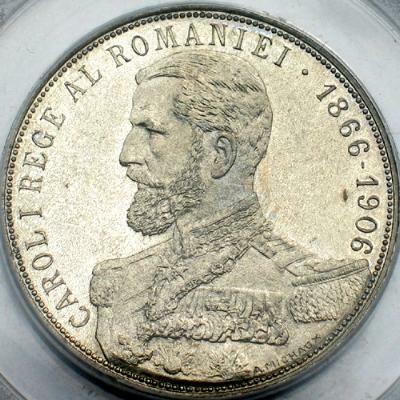 The silver and gold coins struck in 1906 were issued to celebrate the fortieth year of reign for king Carol I of Romania. Minted in Brussels, they were designed by Alfons Michaux. This highly impressive coin set features the following values: 1 leu, 5 lei, 12 1/2 lei, 20 lei, 25 lei, 50 lei and 100 lei. To the best of our knowledge, these coins circulated effectively, the lesser ones at least. 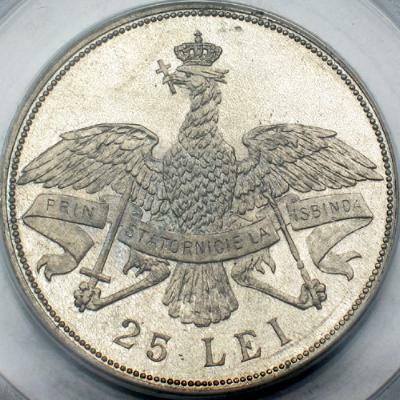 Part of the silver coins of 1906 were struck with silver from older used coins that were melted (face value of melted coins: 1.700.000 lei - information from Mr. J. M.). 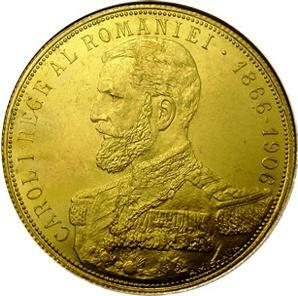 The 25 lei 1906 gold coin pictures above are present on Romanian coins through the kind permission of Mr. Radu Lissner. The design of crowned heraldic eagle, holding cross in its beak, sword and sceptre in its talons, bearing banner with sentence "PRIN STATORNICIE LA ISBINDA", is almost identical to the one of Order Carol I, established the very same year 1906. "The gold coins of 50 lei of 1906 exist in two varieties, i.e. with a red and with a yellower colour. 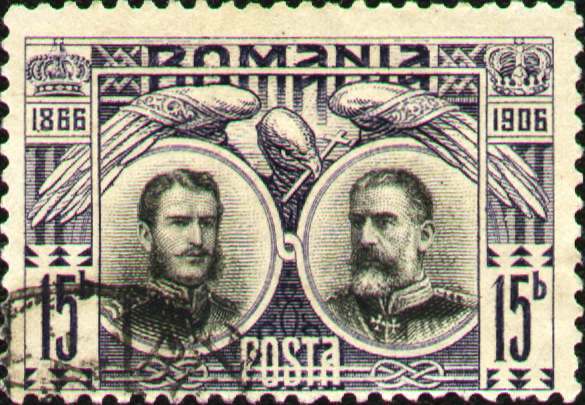 This difference was intentional, in the sense that after a first strike in red gold (consisting of an alloy of 900‰ gold and 100‰ copper), the Romanian government asked that part of the copper of the alloy be replaced by silver, in order to obtain a yellower colour, thus better resembling the coins of 4 ducats of Austria, made of 986‰ pure gold. The alloy of these yellow coins is: 900‰ gold, 85‰ silver and 15‰ copper; this alloy was furthermore found to be more suitable for striking these flat coins, and was also used for all the pieces of 12.5 and 25 lei. 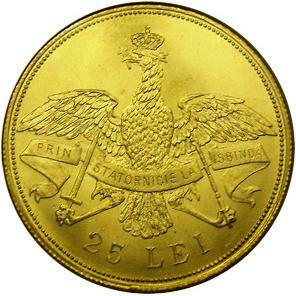 Mintage figures for the two types of the 50 lei are as follows: red gold: 8,000 - yellow gold: 20,000." The 25 lei 1906 white metal essay pictures above are present on Romanian coins through the kind permission of an anonymous donor. The forty years of reign of Carol I were also celebrated through a ten value philatelic issue. Below is one postal stamp picturing Carol in 1866 and in 1906.